Another great chicken spaghetti recipe to try...spiced chicken spaghetti from Shan. Sauté 1 chopped onion and chicken in stock pot. Add spices and continue cooking until any liquid evaporates and the chicken almost sticks to the pot. Add the tomato paste and stir around for a minute. Add chick peas and two cups water and bring to a boil. Lower heat and simmer about 30 minutes. When chicken is about 20 minutes from done add the sliced onions and peppers to the sauce and bring back to a simmer. (cook your pasta now) When the onions and peppers are cooked, pour liquid over pasta and stir. Spoon onions, peppers and chick peas over top of the pasta and arrange the chicken on top. 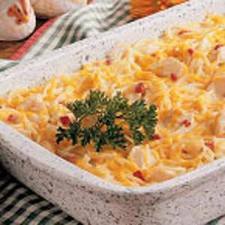 This tasty chicken spaghetti is ready to serve...nice taste !